The last two weeks have mostly been put to use in clearing and tidying. 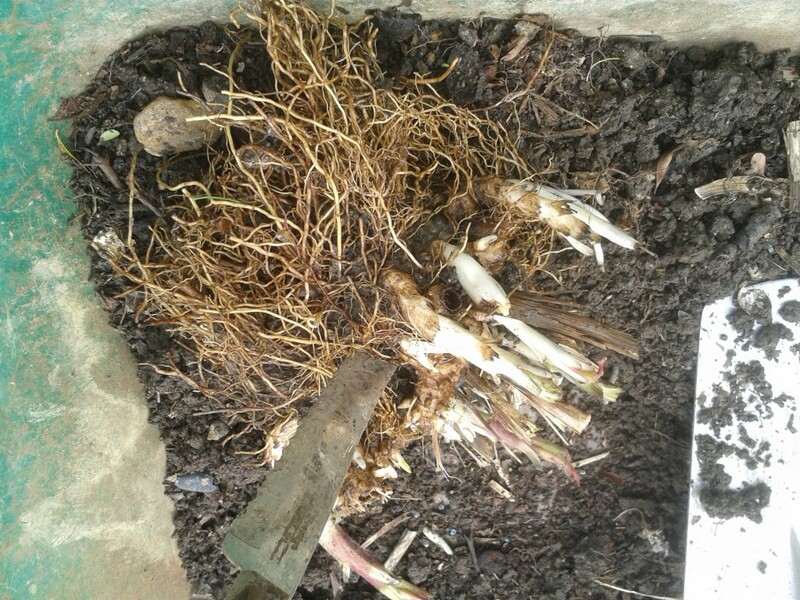 That took care of the jobs that either the cold or water in the soil prevented. That has involved some hard landscaping, replacing a slippery path with something more stable, cutting and edging lawns. 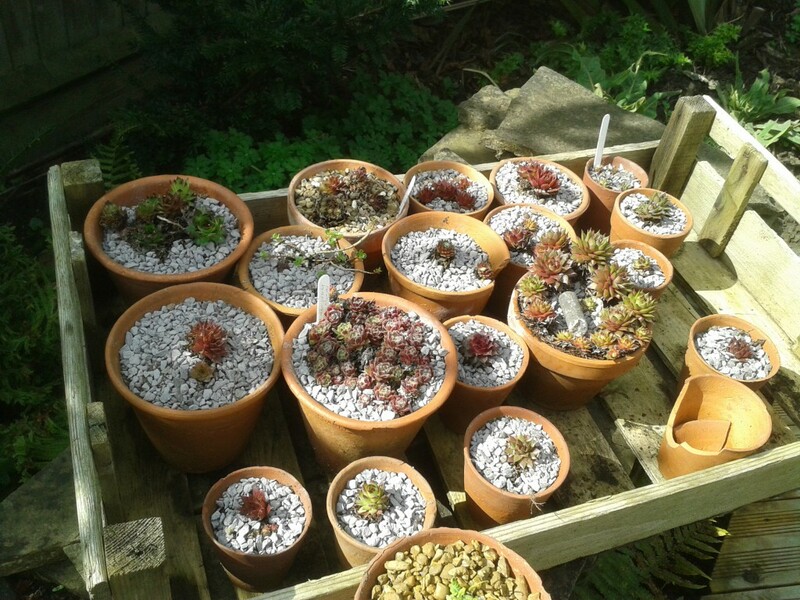 I have also been potting on plants grown from seed and cuttings. 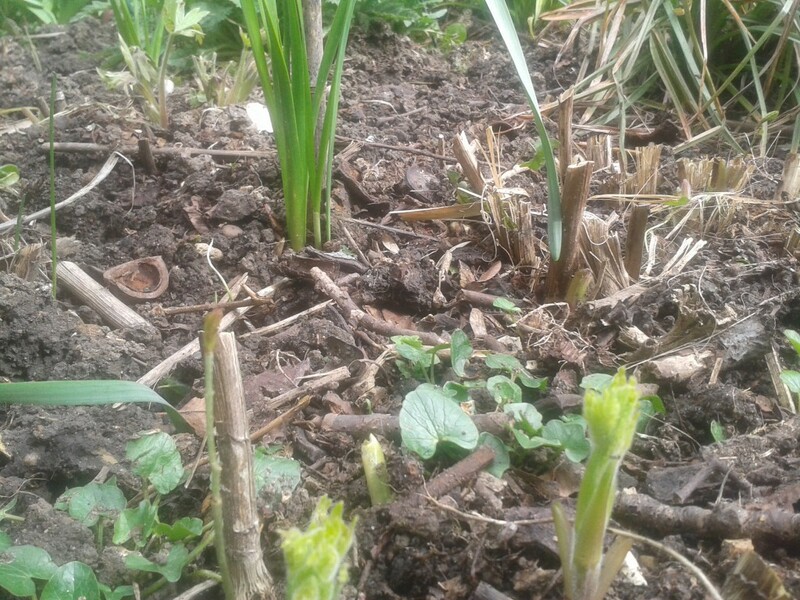 And setting out Dahlias to start sprouting in the greenhouse. These alpines were in need of tidying and redressing. Now they’re ready to go out. And the beds have have a good clear out too, with the last of the winter structure removed. That included any detritus that had been previously left as protection. 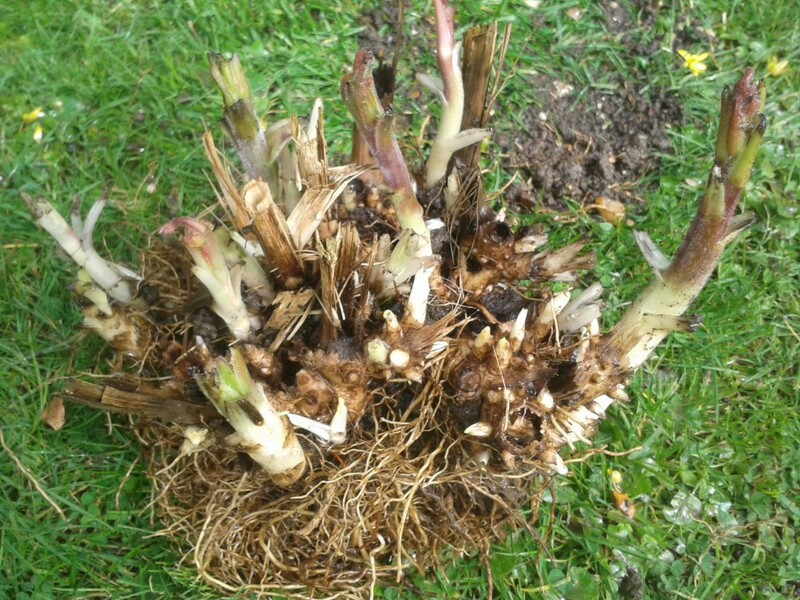 I also used the opportunity to remove some of the very invasive bluebells that can colonise the front of borders. Finally another mulch of rough garden compost and its ready to start growing. Some of it’s off to a great start. This year seems to be about 3 weeks later than last year after the warm early spring we had in 2015. That always leads to an anxiety about where certain plants are, have they appeared yet, will they appear? The obvious things so far missing are Heleniums – three differerent ones not so far seen – a couple of Echinaceas, and Achillea and all the Hostas. I went to an open garden in Cookham on Sunday and the Hostas where all showing nicely. The cold blast due this week will certainly slow progress down a bit more. 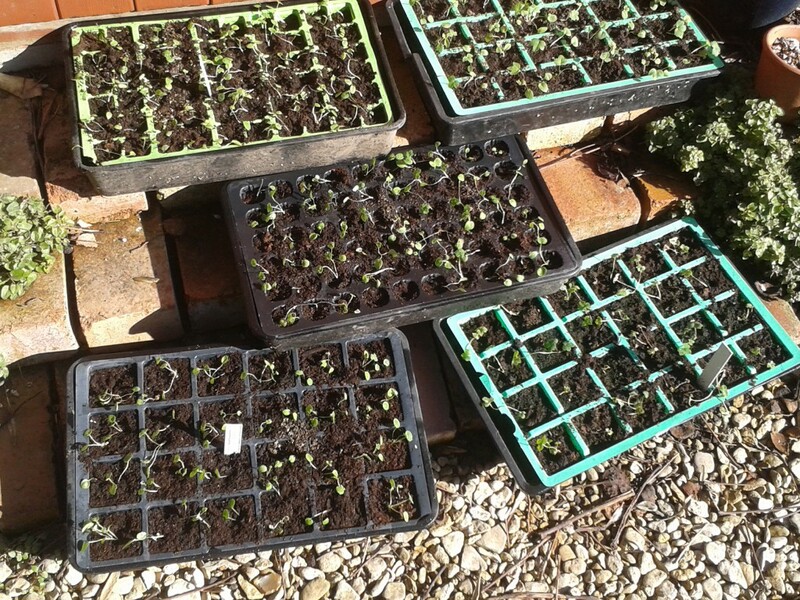 So those plants potted and ready to go out will have to wait a week or more than expected before they can be planted. 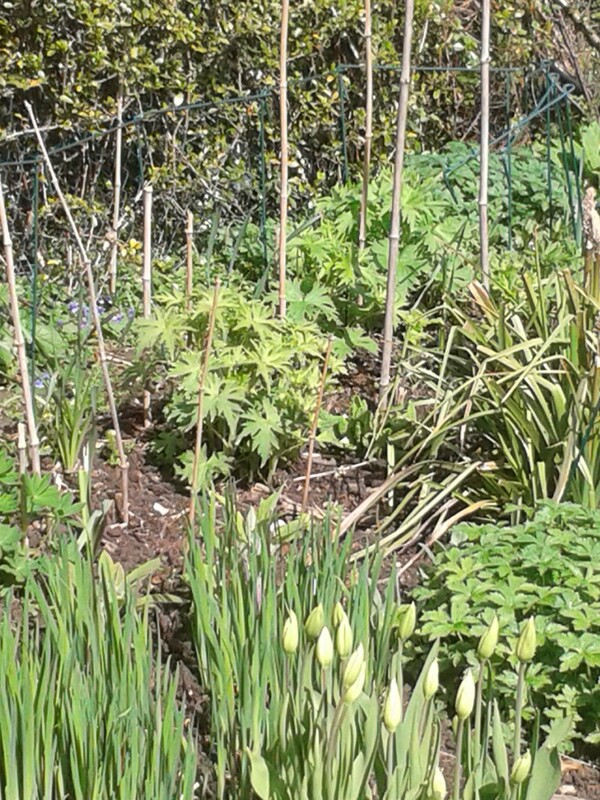 The main flower border is not looking too bad though so far. I have some greenhouse borders that are spare before tomatoes are due to go in. 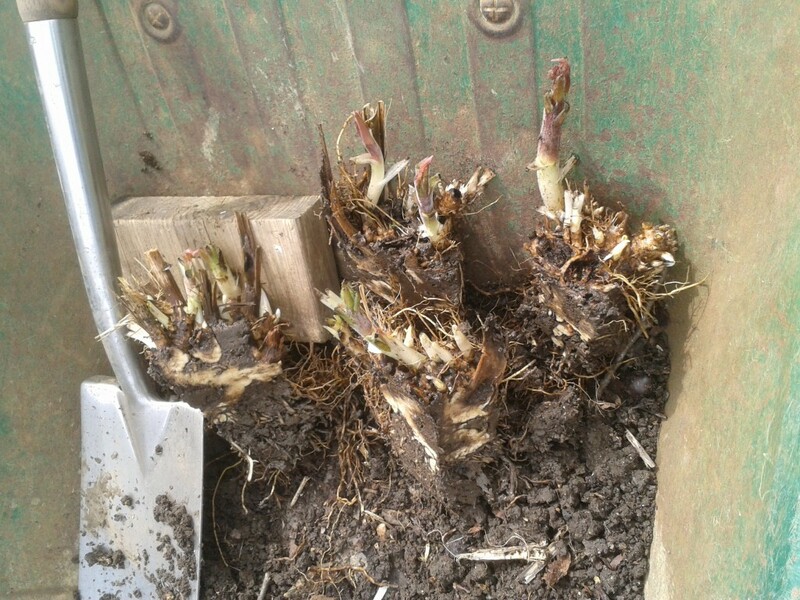 These will be used for the Dahlia tubers, laid out and gently watered to stir them into life. That way I can see what is growing before setting them in beds or pots; nothing worse than carefully planning where to put them and finding nothing grows. So far about 10 of 80 are shooting, with more showing every day. 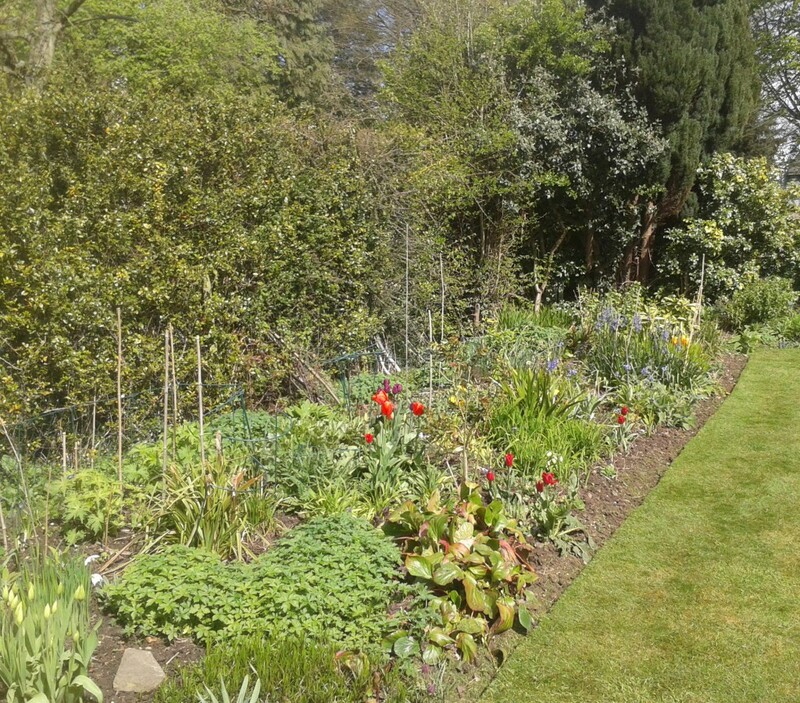 Not too much more on this front, but the broad beans are all out. 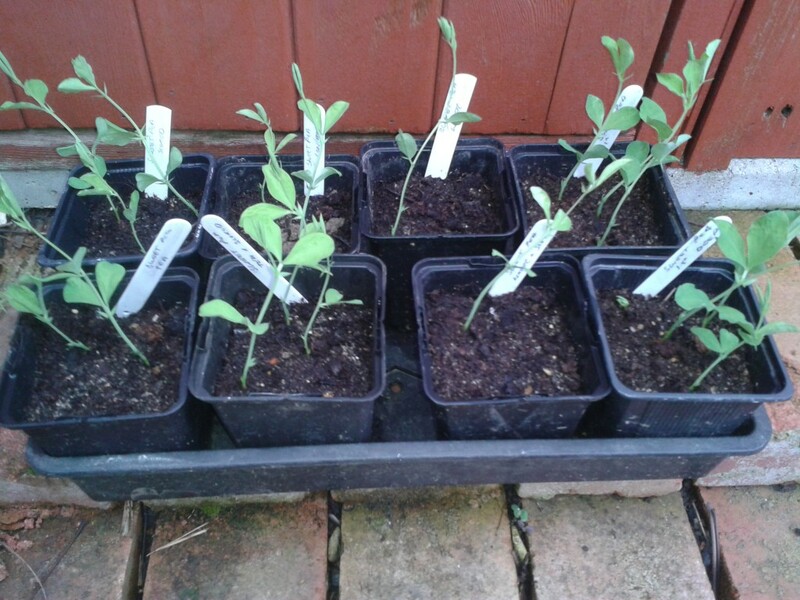 Peas are planted in between potatoes, and many leaf and salad veg are ready in pots to go out. they too can wait until the cold spell passes. And the process of creating more and better stronger plants goes on. Last weekend a friend came over with a couple of chunky Salvias – not something I’d grown before – so they could be split. 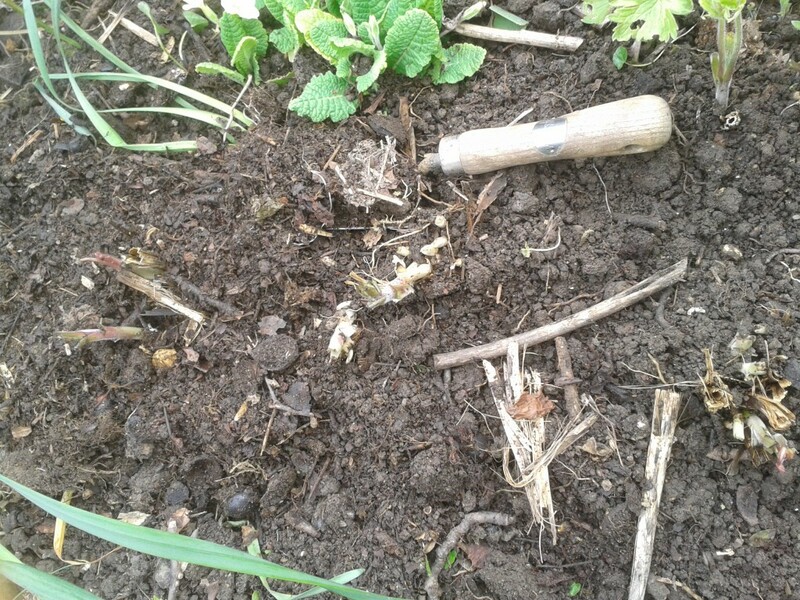 They were tough to break, with the carving knife not being man enough I resorted to a spade. She took the main divisions and I kept one, plus all the bits that fell off. I have planted them in a sharp draining compost and kept in the propagator for a few days. It looks like 90 per cent or so will be good. That’s a good block for the garden beds and some for the Plant swap on May 7th. Spring plant swap will be held on Saturday 7th May at 10.00am. Please come along to this, the third plant swap at Abbots Corner. Bring plants you have propagated in your own garden, and take away some bought in by other locals – you know they are likely to thrive. A few varieties of crysanthemum ( small bloom garden types, not the big monsters. It’s all very simple. You bring one, and you take one. Brian has lots of the most spectacularly marbled leaved Cyclamen, and is bring those. Suitable for a shady spot and flowering late in the year until at least March. Drop me a note to say what you have to bring, and what you might be looking for, and I will post it on this page . The spring plant swap will be held on Saturday 7th May. Book your place by sending your details below. A few weeks ago I shared my seed sowing ideas with friendsI mentioned the tests and comparisons I was making to find the most successful way to sow seeds and grow on seedlings. These have now to conclusions, and the answers are not what might have been expected. Test one was on sweet peas. With a historic 50 per cent germination rate I thought there had to be ways to improve production. Thompson and Morgan have a useful page of suggestions, but some of it seemed just too much hassle. So I put it to the test. They included soaking in water, soaking in tea – using the tanins to mimic passing through a birds digestive system. And also chipping the seed, not chipping them, planting them shallower or deeper than suggested. Nothing made a real difference, except for the deeper planted seed. They had not been soaked or scored in any way, just planted 4cm deep as opposed to 2cm. They came up faster and notably stronger. I shall repeat that specific test for confirmation this week. 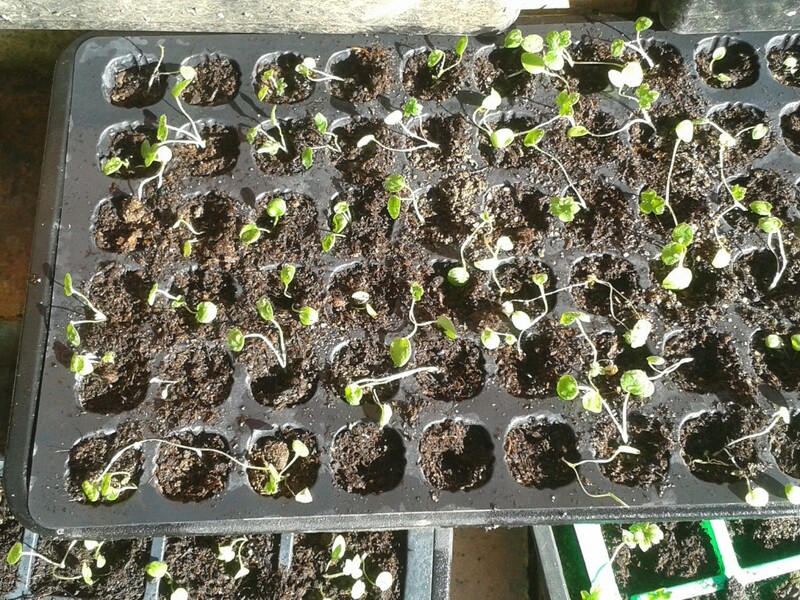 I sowed 5 different seeds – Digitalis, Achillea Cerise Queen, Achillea Gold Plate, my own super Delphinium strain and some chilli peppers left from an earlier sowing – in lines across trays of compost.They were lightly covered with compost and soaked them from below in a water tray. They were next to each other in a heated propagator. This produced interesting results in what actually germinated and how they behaved in the weeks following. 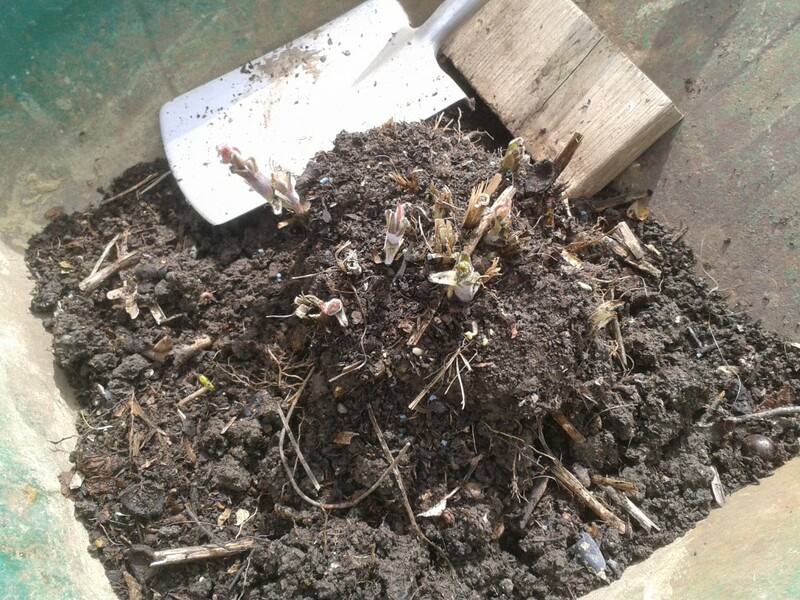 In the JI seed compost the Digitalis was up first after about a week, followed by the Delphiniums and a few of the Gold Plate. Nothing was going on with the MP still. Another few days later and there was growth in all 5 lines of the MP tray, but nothing different in the JI. A further week passed and all was ell with the MP, but the Digitalis had all died back in the JI tray. My conclusion was that the composts were drying out at different rates, and the MP retained water longer. The Achillea Gold Plate and Delphiniums were all pricked out into trays and look strong. I have left the MP tray still to watch the slower growing chilli seeds, and to see what happens with the faster growing Digitalis. The final test was in potting on, and what happens when using larger or smaller cells for growing on. I used 24, 54 and 60 cell trays available from the garden centre. After 3 weeks the 24 cells plants are showing strong growth and ready to pot on further. The 60 and 54 cell plants are not so evidently growing away. They are are susceptible to some cells being either too wet or too dry. And it is hard to tell if the seedlings are not growing in the smaller cells, or if they are being restricted by them. I will take them all apart this week for a definitive answer, even though that may mean sacrificing some of them. So the conclusion is to use larger cell trays and stick with multipurpose compost, rather than the more expensive John Innes seed mix.